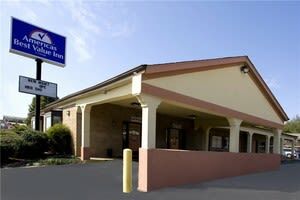 Americas Best Value Inn Huntsville is a recently remodeled, two-story, U-shaped exterior corridor hotel. Appreciate the convenience of our on-site guest laundromat and vending/ice machines. Our 82 comfortable guest rooms feature free wireless high-speed Internet access, microwaves, mini-fridges, cable TV with HBO and Showtime, desks with lamps, tables with chairs, hairdryers, alarm clocks, free local calls, and wake-up service. Connecting rooms, irons, and ironing boards are available upon request. At Americas Best Value Inn Huntsville, We've Got You Covered from the time you hit the road until your head hits the pillow.